The Tweak Tool can be used to make small color changes to objects. In doing so, it changes the Fill and/or Stroke color of an entire object. While it can be used to change the color of Gradient stop, it cannot create Gradients nor can it modify part of an object leaving the rest alone. This is due to the fundamental nature of vector objects. It can, however, be used to adjust the color of a group of objects, with the objects closer to the cursor changing the most. Two modes with several options exist for tweaking colors. Paint. (Shift+C) Paint with current Fill and Stroke style. When the tool is selected, changing the Fill or Stroke by using the Fill and Stroke dialog or the Palette will change only the Current style and not any objects. If either Fill or Stroke are not set, the Fill or Stroke of tweaked objects will remain unchanged. New in v0.47: Holding the Shift will invert the color applied. Jitter. (Shift+J) Randomize colors. The Current style is not used. The Tweak Tool was used to modify a grid of gray squares. Left: In Paint mode the tool was used to paint diagonal red and blue lines. 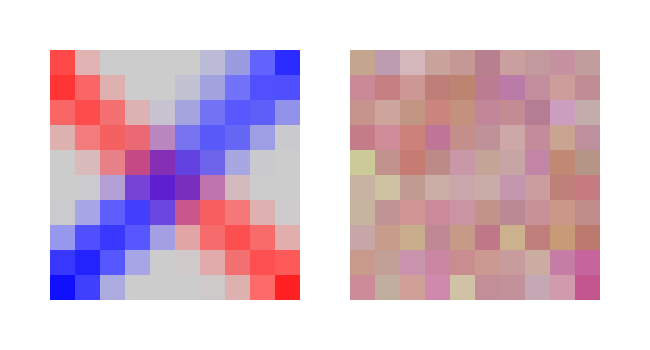 Right: In Jitter mode the tool was used to add a random color to the squares. The Tweak Tool in a color mode has four options. It can act independently on a color's hue, saturation, lightness (HSL) and opacity. The options can be toggled on independently by the H, S, L, and O icons next to the Channel label in the Tool Controls.